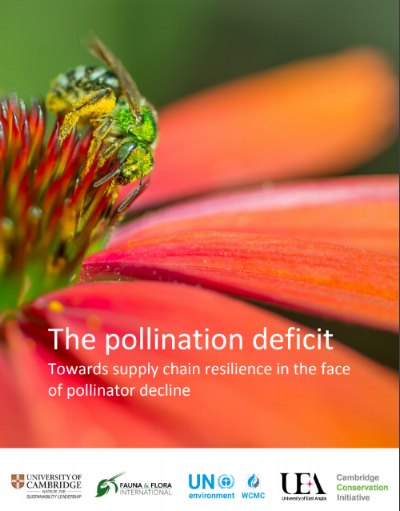 The University of Cambridge Institute for Sustainability Leadership, Fauna & Flora International, the UN Environment World Conservation Monitoring Centre, and the University of East Anglia have published the report “The pollination deficit: Towards supply chain resilience in the face of pollinator decline”. The four organizations not only confirm that wild pollinators are in decline (at least 33% of wild bee and butterfly species are close to local extinction), but also emphasize that agricultural supply chains are at risk: “Pollination is worth up to $577 billion annually. 75% of food crops depend on pollinators and 50% of crop pollination value comes from wild, free-living insects. Better integrate pollinator-friendly practices into standards. The Sustainable Agriculture Network (SAN) has been the first organization to include a broad range of pollinator-friendly practices into its Sustainable Agriculture Standard with the purpose of promoting conservation, restoration and sustainable use of the pollinator diversity on farms and their ecosystems. The 2017 SAN standard not only asks farmers to conserve all type of natural ecosystems – crucial habitat to maintain insect, bird and bat pollinator populations – but also requests them to ban systemic insecticides that are taken up by the plant and transported to all its tissues (leaves, flowers, roots and stems, as well as pollen and nectar). The most harmful insecticides according to multiple scientific reports are the three neonicotinoids clothianidin, imidacloprid, and thiamethoxam, and the phenylpyrazole fipronil – sold as commercial products since the mid-1990s. These broad spectrum insecticides not only kill pest insects, but also have the potential to kill a wide range of beneficial insects, such as pollinators. Another important part of our work is to increase awareness of other chemical pest control substances with high risk for insects, birds and mammals based on a scientific risk assessment of the Oregon State University’s Integrated Plant Protection Center. The use of these pesticides with proven risk to bees, birds and mammals should only be suggested to farmers, if spray drift of these pesticides to core pollinator habitats (natural ecosystems and flowering weeds) can be avoided through non-spray zones or the establishment of vegetative barriers. Fire should not be used to clean production plots or control pests. State-of-the-art pollinator protection programs should also include the restoration and conservation of more native vegetation for diverse agroecosystems that provide more food resources and reproduction sites for these beneficial animals. SAN also pleads for the protection of large non-crop trees and the control of competing invasive alien plant or animal species that can affect pollinator populations. According to the Intergovernmental Science-Policy Platform on Biodiversity and Ecosystem Services (IPBES), the main factors exerting pressure over pollinator populations are habitat loss, degradation and fragmentation, competition by exotic species, pesticide and herbicide use, changing water and food availability, varying temperatures and rain patterns, as well as propagation of pathogens and fire use. It is not only crucial to create awareness about the risks that damage pollinator populations in the North, but work with pollinator-friendly approaches in some of the most biodiverse regions in the world: tropical and subtropical landscapes. In Central and South America, there are more than 1000 species of stingless bees and bumble bees. SAN encourages farmers and buyers of their products to recognize the importance of pollinators as an agricultural input and attend the pollinator population challenge with an integrated and practical approach. We believe that certification is not the only tool to promote sustainable agriculture. With effective guidance and training, farmers can contribute significantly to the conservation of pollinators. Only with consciousness about risks for insects, birds and bats and committing to practical actions to conserve their populations, we may be on time to avoid irreparable damage to pollinators in the future.